In April, I asked a few Heartland owners to help me warn others about regrettable RV accessory purchases: items they bought that just didn't work out. This month? This month, it's time to flip the coin and report from the opposite side. 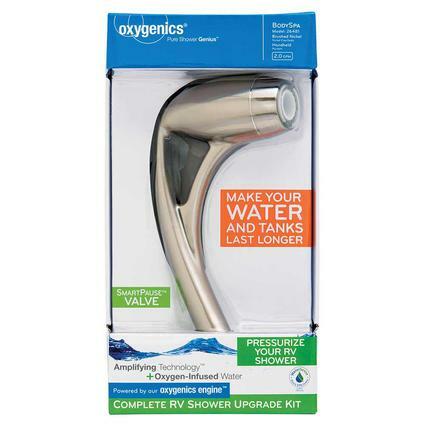 "Uses less water and the pressure is great. My family loves showering in our RV now." "Where we live is hot and humid, and we will soon be moving to the wet Pacific Northwest. We found that we were sticking to our furniture and bedsheets, and the bathroom just never seemed to completely dry out after showers. This dehumidifier has curbed those issues, and as a bonus has helped with the efficiency of the A/C units." "Our new toilet eliminated some unpleasant issues. It's taller so it's more comfortable to sit on; the bowl is deeper so there's plenty of space between us and the water; the seat and lid are both sturdy wood rather than plastic; the seat is elongated instead of round, making…um…personal hygiene tasks easier; when flushed, it rinses all the way around the bowl from under the rim; and it has a hand sprayer to quickly dispatch any stubborn residue. In short, it's much more like a residential toilet, which is exactly what we want in our full-time home. It was easy to install, too. Who knew a lowly toilet could make us so happy?" Here's a video of the product installation on David's blog, Landmark Adventures. "What makes them worth every penny is that they easily adjust to a variety of terrain, and have adjustable stabilizing legs which make contact with the ground, eliminating bounce. The step size between each step adjusts equally, so there is no gigantic step at the top or bottom of the rise. 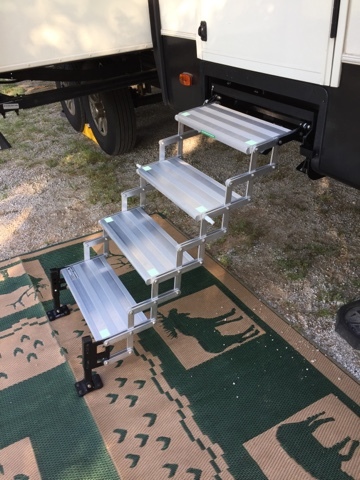 No need for a portable extra step, ever again! For me and my poor knees, these steps are a true lifesaver. I no longer have knee stress with step sizes that are uncomfortable. These steps will go with me if we ever change coaches." Only owners who provided responses to my interview questionnaire were included in this article. For even more ideas, join the Heartland RV Owners group on Facebook to visit this discussion. And feel free to comment below with your own tale of money well spent!